This used to be Dosa Temple, but they have re-branded themselves as a vegetarian fusion restaurant. 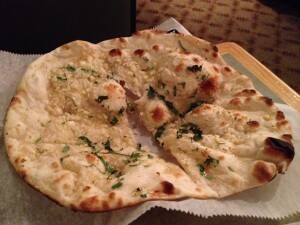 We shared samosas ($4), garlic naan ($4), saag paneer ($12) and a special masala dosa ($11). I was really pleased by our meal. 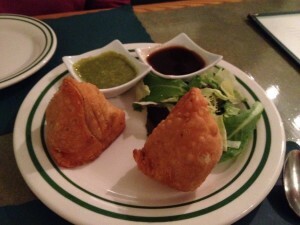 The samosas were delicious; the dough was light and flaky and the potato and peas filling was well seasoned. Carol especially enjoyed the tamarind dipping sauce that came with it. 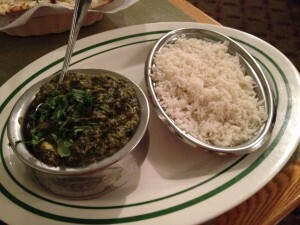 The saag paneer was some of the best I’ve had in Boston. The spinach curry was flavorful, but not too spicy and the chunks of cheese were fresh and firm, without being tough. The naan came piping hot and crispy, although I think the naan at Mela was better. 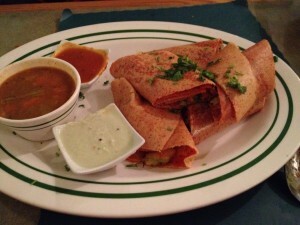 The dosa was too a little spicy for me, but I still enjoyed some with copious water. We ended the meal with gulab jamun ($3.5), the fried milk balls soaked in cardamom sugar syrup. I’ve always had these chilled, so it was a delightful surprise when they came out hot. I think when they had a more tender texture, enabling better syrup soaking when warm. I think I have a new favorite Indian restaurant.